Your kitchen staff will look sharp in these 100 percent cotton chef coats with 12 large knot buttons. These stylish cook uniforms also have three-panel backs along with underarm vents for added comfort and coolness while preparing and cooking meals. Our fine kitchen uniforms also feature sewn-in collars and extra bar tacking, fine detailing for a clean line and extra button holes that speaks to the quality of this product. 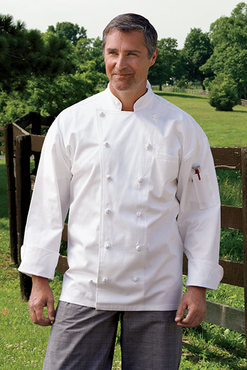 Available in black or white, this executive chef coat comes in sizes ranging from XS to 6XL. Fabric: 100% Premium Cotton Twill - 7.5 oz.